lack Swan is out of Chrissy's second litter. After strategic planning, David took Chrissy up to the village of Cayuga, New York for a rendezvous with CH Capriole's Mystic Chalice, known to all as Goblet. Goblet held the No 1 position if Field Spaniels in 2009 and was shown in our area many times. We fell in love not only with his exceptional beauty and grace, but also with his easy going, gentle nature. We will always be eternally grateful to Peter Archer for his efforts to bring Goblet out of Canada and agree to this breeding. Gigi has many qualities that we recognized in Goblet and her elegance is not overlooked in our house. Her gracefulness reminded us of a swan, hence the name of Black Swan. She is also a bit of a diva, always expecting special treatment. She is focused and fast. Where she can appear head strong, it is a matter of personality in that she is more prey driven and my other dogs are more pack driven. Gigi has 10 points towards her championship, including 4 and 3 point majors. 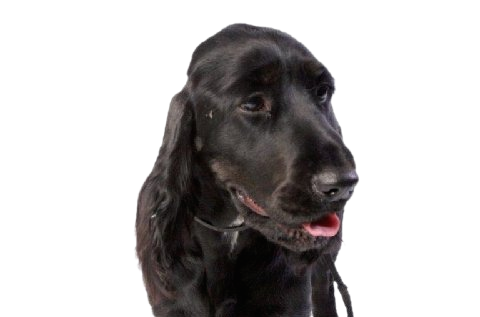 She made the trip to Eukanuba in 2011 to participate in Meet the Breeds to represent black Field Spaniels.Her glossy, easy care coat and playful disposition certainly attracted lots of attention, especially with children.